Burgoyne Blossoms is a Burgoyne Surrounded quilt pattern. I have been wanting to try this pattern for several years, and even though it uses a strip piecing technique which is typically easy, this pattern looked challenging. Probably because the smallest squares are really small. In this case, the small squares measure 1 1/4″ finished. Part of the challenge of small pieces in a pattern is that they don’t allow for seam allowances that aren’t fairly precise: they have a very small tolerance. I find that on bigger pieces, that there is a bit of fudging that one can do to make all the seams line up nicely. But on the small pieces, there is very little wiggle room! What is your acceptable tolerance for seams lining up? 1/16″, 1/32″ or zero? How much time are you willing to spend ripping seams to get them to line up perfectly? Do you allow yourself a bigger or smaller tolerance for point seams? Another challenge in the Burgoyne Surround quilt pattern is in the construction: it is really a master block that is comprised of many component blocks. The instructions for this quilt pattern are in a book I have had for years, Quilting for People Who Don’t Have Time to Quilt by Marti Michell. This is the book that opened my eyes to the strip quilting technique. The blossom fabric was one from Edith’s stash, and the pink polka dot used as the main background fabric was from Granny’s stash. The soft rose pink was one I have had in my stash for years: as I recall, I was planning to make dresses for my daughters when they were young, but never got around to making them. Back then, not only was I one of the People Who didn’t Have Time to Quilt, but I also didn’t have much spare time to do much sewing in general. I count myself fortunate that I now have more free time to spend on quilting. Over the past 3-years, I have made over 60 quankets. Check out my photo gallery here. 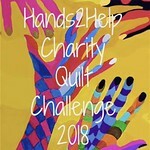 I will be linking this to this year’s 100 Quilts for Kids annual charity drive, which is being coordinated by Alyson who blogs over at The Hasty Quilter. This year’s drive will run through the end of November, so you still have time to participate. This quanket was donated to the County of Ventura, Children & Family Services, for a foster child in April, 2017.